The Good Corner Restaurant is a restaurant specialising in Western food located near to the railway station and night market in Udon Thani. Of the places I have eaten Western style food in Udon Thani I think that the Good Corner Restaurant is the best both in terms of the ambience in the restaurant and the quality of the food itself. 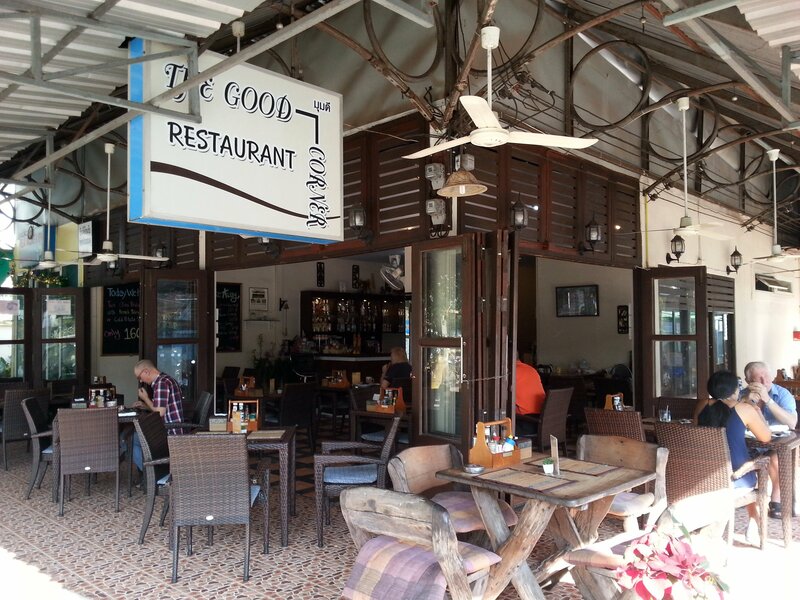 The Good Corner Restaurant is, as the name suggests, on the corner of a side road leading off the Prajak Sillapakom Road. This is the most popular area in Udon Thani for foreign visitors to the city and there are plenty of other restaurants within a 300 metre walk which also serve Western food, but the Good Corner Restaurant tends to be the busiest. The restaurant is well placed for passing trade because of its location and it takes full advantage of the commercial opportunities of that location by looking inviting. with the restaurant open on two sides and plenty of outdoor seating. If you read reviews on TripAdvisor about this restaurant you will find the rather odd criticism that some reviewers don’t like the Good Corner Restaurant because it’s always full of foreign visitors. 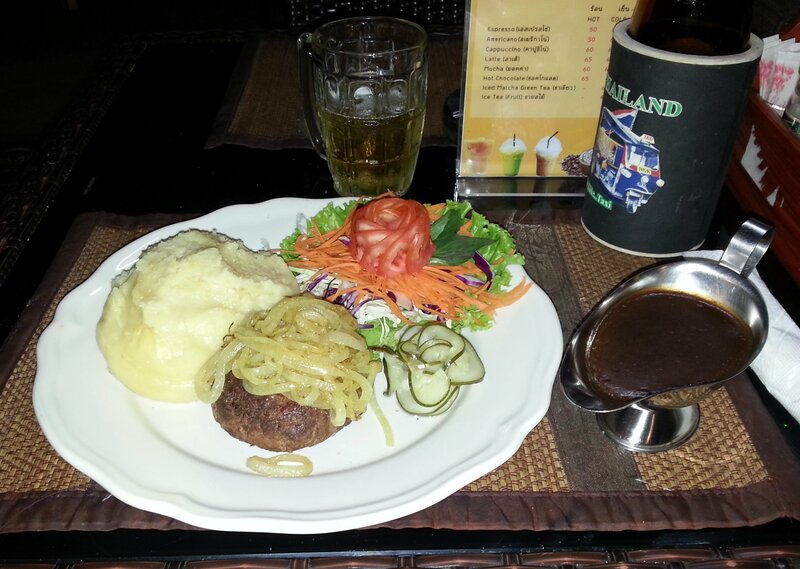 The criticism is a bit odd because the restaurant focuses on catering for foreign visitors with Western style food. It does this as successfully as the nearby food stalls which provide dishes that appeal to taste and budget of people who live in the city. The menu at the Good Corner Restaurant has a lot of Western style dishes and a few Thai dishes as well. Like many other really popular restaurants in Thailand specialising in Western food, such as Buffalo Bill’s Tavern in Hua Hin, the Thai food on the menu is there for possible catering for a minority of visitors to the restaurant who will eat Thai food whilst the other people they came to the restaurant with eat Western style dishes. The Western food includes English breakfast, pizzas, burgers, steaks and Danish dishes. The pizzas aren’t great, and the burgers are average, but the English breakfast at 130 THB including tea or coffee is good and the Danish dishes are excellent. I really like the hakke boeuf, which is Denmark’s most popular dish consisting of beef patties served with soft fried onions, mashed potato and pickles served with gravy. At 210 THB I thought the hakke boeuf was reasonably priced and a strong contender for the best plate of Western style food that you will find in Udon Thani. The Good Corner Restaurant is located 350 metres walking distance from Udon Thani Bus Terminal 1.